We are official PC Volunteers and have moved to Gonio. It has been an exciting few days. At 4:00 AM on Thursday (July 19th) our city, Telavi, was hit with a very strong and damaging storm. Unbelievable rain, hail, wind. The city was decimated with roofs torn away from houses, power lines downed and windows shattered. All vegetation, grapes, gardens, fruit trees and even large trees were heavily damaged or completely destroyed. It was sad and hard to leave on Friday as we departed for our swearing-in ceremony and travel to our new home. Friday was our swearing-in where we left the throes of trainee and became official Peace Corps Volunteers! The ceremony lasted about two hours and featured a Georgian men’s singing group at the beginning, speeches from American and Georgian dignitaries, the actual moment when we took the official oath and ended with a few songs from a Georgian women’s musical group. I hope the pictures will do this justice. After the excitement ended we packed Tom’s director’s car with all our luggage and headed off to Gonio/Batumi where we will hopefully spend the next two years fulfilling the Peace Corps’ Mission. Our new home is in Gonio, a small village just south of Batumi. Actually Gonio is part of Batumi but still has the village characteristics and life style. Our new host family consists of five members, Nodar, host father, Meri, host mother, Margarita, host grandmother, Aleko, host brother and Eliso, host sister. Nodar is a medical doctor working in a local clinic, Meri is a teacher who teaches at the same school as Suzanne and Margarita is a retired teacher. This first week was the beginning of our integritation into the local community, learning bus and marshutka routes, finding local magazias (markets) and walking the neighborhood. There is only one main road through Gonio and it leads right into Turkey which is about 7 miles down the road. This is a costal area and the one big attraction is the Black Sea which is a little over 500 meters from our house. The Black Sea beach is stoney instead of sandy but the stones have been polished and smoothed by the water and they are easy to walk over. Aftermath of the Big Storm in Telavi. Traditional Georgian men’s singing group. Richard, country directory and Tengo, PST program director. We were all seated on stage listening to the proceedings. Just about ready to raise our hands for the official oath of service. Traditional Georgian women’s musical troupe. The Black Sea, looks blue to me! The official get the feet wet ceremony. 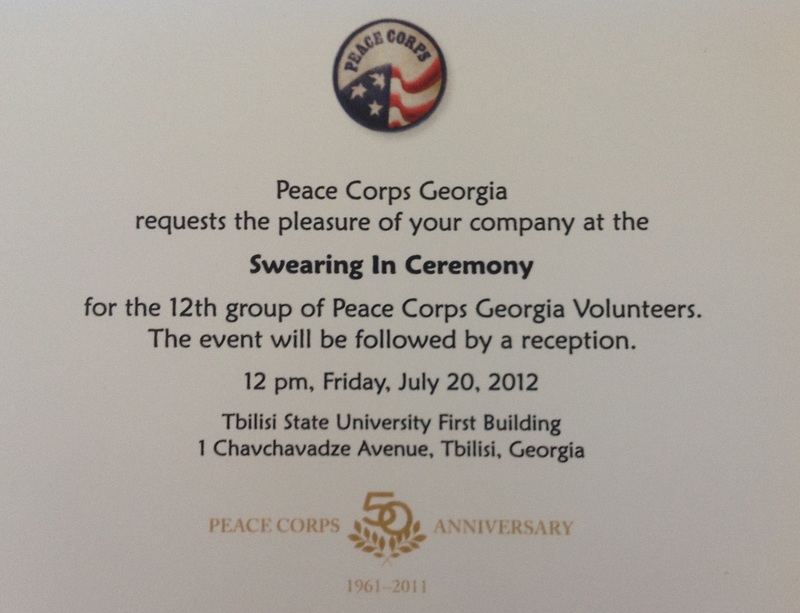 Official Peace Corps Swearing in Ceremony Invitation. 8 down and 3 to go. შეგიძლიათ დაჯერება! რვა კვირის განმავლობაში არ მოვიდა და წავიდა და მხოლოდ სამი სანამ გახდა ოფიციალური მშვიდობის კორპუსის მოხალისეები. Can you believe it! Eight weeks have come and gone and only three more before we become official Peace Corps Volunteers. It’s true what they say about life after Site selection and Site visit — everything appears to be going down hill as we rush to the finish line. So what happened this past week. Oh yes, there was this flu bug still hanging around. First Tom, that’s me, had it badly last week. Then I seem to have given it to Suzanne who was in bed one day with a fever and still has this nagging cough. But, generally we are doing well and staying healthy. Not so with some others. One poor gal has parasites and that is one thing we don’t want. Yesterday we had a visit from the American Ambassador who, unfortunately, is on his way home in 3 weeks. He was very impressive and gave us quite a good insight into why this country in particular is so important to America. It seems that Georgia is one of the best funded countries, per capita, from the U.S. The relationship with Russia is surely one reason but he also pointed out the strategic spot Georgia has in the Caucauses and the number of other countries who do business through here. It was a helpful retrospective. He also gave us a “shot in the arm” by saying that we are the true ambassadors of our country to the folks in the villages and towns who never wander outside their region. It was a good reminder. On Wednesday, the whole troop went to Tbilisi to visit the Peace Corps office and also visit other organizations who might have something to offer us as we work in education or business. Everyone brought back materials from the places they visited and we had and ‘in house’ resource fair on Friday so all could take advantage of these materials. “Man does not live by bread alone”. In Georgia, they might argue with that a little. In this country bread is the staple of life. You will find small bakeries on what seems like every block. We have seen people come up to the little window at the bakery and walk off with stacks of bread. Now there are different types of breads but a common one is called Tonis Puri because of the way it is baked on the sides of a very hot kiln. This morning our ბაბია, (bebia) that’s Georgian for grandmother, baked bread so below you will find several pictures of her in action. Getting ready to put it in the oven. At last, the finished product!